"I have raspberries growing in my yard, and I think of pie at this time of year." Line a 9 inch pie plate with pastry, and brush with egg white. Arrange berries in crust. Combine sugar and cornstarch; sprinkle mixture over the berries. Dot with butter. Cover with upper crust, and seal the edges. Bake for 10 minutes. Reduce oven temperature to 400 degrees F (205 degrees C), and continue baking for 30 minutes. This was a great, simple pie. Next time I will use a little less sugar, I found that sugar over powered the tast of the raspberries. Other than that it was great. Excellent! 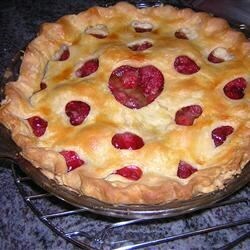 And lower in fat than many of the other raspberry pies listed. Thanks! Even works great when you simply buy the pre-made pie shell crusts in the frozen section of the grocery. THIS IS AWSOME! THE BEST EVER TO BE MADE IN MY KITCHEN! I AM LEARNING TO BAKE PIES AND THIS ONE IS EASY. THANK YOU! Perfect! my boys picked the berries and helped bake the pie. I used 3/4 cup brown sugar and 2 tsp. cornstarch. Everyone said it was the best berry pie they have ever had!